Why Revenue Neutral Isn't, and Other Costs of the BC Tax | Watts Up With That? I hope against hope that this is my last post on this lunacy. I started by foolishly saying I would write about the benefits, costs, and outcomes of the BC carbon-based energy tax, so I was stuck with doing it. I discussed the possible benefits of the tax in “British Columbia, British Utopia“. To recap the bidding from that post, I showed that if we assume 1) that the BC folks could hold their CO2 emissions steady, with absolutely no increase for 50 years, and 2) that CO2 is the secret control knob that regulates planetary temperature, and 3) climate sensitivity of the secret CO2 control knob is not less than 3°C per doubling of CO2 … assuming all of those things, they’d achieve a 0.003°C reduction in temperature in half a century. Anything less than 100% on any of those, of course, means less than three thousandths of a degree savings. I followed that with an analysis of the pre-tax and post-tax changes in the motor fuel sales in BC called “Fuel On The Highway In British Pre-Columbia“. Curiously, both total and per-capita road fuel (diesel plus gasoline) have increased since the tax was passed. Next, I discussed how people are avoiding taxes by legally buying fuel in the Evil Carbon Empire, the USA, in a post called “The Real Canadian Hockeystick.” That just leaves the costs, and that means that once I finish this post I can go back to indulging in real science, or alcohol, or anything but carbon-based energy tax. So here are some of the important costs to individuals, to businesses, to the economy, and to society in general. Cheap energy is the salvation of the poor farmer, the poor housewife, and the poor in general all over the planet. It is also literally and figuratively the driving force of a developing economy. This means that anyone advocating policies that add to the price of energy is actively harming the poor, the farmer, the housewife, and the economy. In addition, those advocating increasing the price of energy are slowing economic development in the parts of the planet that need it most. I don’t care if you say you’re averting rumored harm to the farmer and the poor in fifty years. That does not justify harming the poor today. That’s the biggest cost of the BC energy tax—it increases the price of energy, the very lifeblood of society, hitting the poor the hardest. That, to me, is the height of cruel lunacy and thoughtless destruction. The first and most important cost of the BC carbon tax is the cost to the poor, to the disadvantaged, and to the economy. The carbon tax is revenue neutral, meaning every dollar generated by the tax is returned to British Columbians through reductions in other taxes. Tax cut measures include income tax credits for low income individuals, cutting the first two personal income tax rates by 5 per cent, providing northern and rural homeowners a benefit of up to $200 annually, and reducing the business taxes. Clearly, they’ve made an attempt to return the money fairly by apportioning it among businesses, individuals, northern and rural homeowners, low income people, and the like, so each group gets back roughly what they’ve paid to keep the revenue neutral. To understand the problem with this, let me try to disambiguate two concepts—“revenue neutral” taxes, and “sin” taxes. “Revenue neutral” means you are swapping out a tax on one thing for a tax on another thing, and doing it in such a way that the tax burden stays the same. In other words, the burden of the new tax is offset by reductions in other taxes. Of course, ideally, a perfectly “revenue neutral” tax would not change any individual’s taxes. Under a perfectly revenue neutral tax change, if you used to pay a tax on A, you would pay the exact same amount now but with the tax assessed on B. In the BC case, for example, where you used to pay a tax on income, instead you’d pay the same amount of tax on energy, based on its carbon content. Of course, there’s a million practical problems with achieving such a perfectly equitable revenue neutrality, and I’ll get to them. But for now, let’s agree that a theoretically perfect revenue neutral tax would ensure that in the changeover, nobody gained and nobody lost. For every single person, the tax you used to pay on A you’d now pay on B. All of the money paid to the government goes back to the public. Nobody gains, nobody loses, fair and equitable, no increase in anyone’s tax burden, it’s just that the tax is assessed on something else, that’s perfect revenue neutrality… hold on to that thought. Next on the agenda is the “sin tax”. This is a tax intended to discourage behavior. Take a tax on tobacco as an example, it’s known to decrease the rates of smoking. Why? Because smokers are the losers, it costs them money out-of-pocket. Typically, the funds raised by sin taxes on e.g. tobacco are used on anti-smoking campaigns, or programs to help people quit smoking, that kind of thing. In a perfect revenue neutral world there are no gainers and no losers, but you need people to lose so they’ll change their behavior … so you have to make it “not-very-revenue-neutral” to make it work. The third cost is one of fairness, and this one has huge ramifications. Children I know all over the world have a clear sense of what’s not fair. Despite being revenue-neutral, which the BC plan demonstrably is, the plan is far from fair. By that, I mean that for far too many people, they are either spending more than they are getting back, or less than they are getting back. People look at that, and they don’t like it one bit. My experience is that most folks don’t mind an equitably shared burden. I pay my California sales tax, 7.5% on most everything, without protest or resentment. I don’t like how some of that is spent, but it’s taxes, everyone pays the same. But if I knew that three of my neighbors paid no sales tax on anything that they buy, and I was being charged not 7.5% but 15%, it would angrify my blood mightily, I’d resent it hugely. And that’s the BC situation. One of the ramifications of this is that perceived unfairness greatly encourages people to cheat, in whatever way that they can. If people feel (correctly or not) that the government is screwing them, they’ll be happy to try to screw the government. This is not good for the rule of law. • are a parent who resides with your child. Only one person can apply for the credit on behalf of the family. In other words, if you’re a young BC resident who (like I did when I was young) is living on his own and working at a job at 17, you’re out of luck. If I’d been living in BC, I’d have been paying energy tax and getting nothing back for two long years. After the two years of paying energy tax, once I turned 19 and was eligible, I could get $115.50 from the BC Government from the LICATC. Now, there’s lots of jobs for which you have to drive a distance. I commuted 45 miles each way for a couple years when I was younger. Someone doing that with an old car, say 15 miles per gallon, might burn six gallons per work day. Two hundred work days in a year, 1,200 gallons. The BC tax is about twenty-five cents per gallon, that’s $300 in taxes I’m paying … and the LICATC gives me $115.50. Once again the poor get the short end of the stick. David Suzuki doesn’t care how much his gas costs, heck, for all I know free gas is just one of the services provided by his adoring female devotees, and he’s got lots of slack in his budget … but the poor have no devotees, and no slack in their budget at all. The seventh cost is the pensions. Every person taking your tax money today and faithfully giving it back to you tomorrow in blessed revenue neutrality will be taking your tax money for thirty years after they retire and not giving back a dime. The eighth cost is the rent-seekers. These include folks like Sustainable Canada and other organizations for whom this is a grant-raising bonanza. Then there are a host of lawyers, advisers, accountants, consultants, and the rest of the good folk who make their living out of the hysteria surrounding the alarmism and the complexities of the regulations. They produce nothing useful, they are a dead weight on society, but they come right along with the tax, they mate for life. The ninth cost is the cost of tax avoidance/evasion. I used to work as an income tax preparer. There’s a distinction between tax avoidance (which is legal) and tax evasion (which is not legal). Seems like a bright-line definition … until you find out that in the US, if you adopt a business policy purely to avoid a tax, the IRS says that is illegal tax evasion. But under any definition there are several costs in this arena of what might be called creative responses to the BC tax. At a simple level, the cost is the money hemorrhaging out of BC into the pockets of American and Albertan gas stations for gasoline. But it’s much worse than that. Next level up, many staples are much cheaper in the US. So when BC residents come across the line to fill up on cheap gas, hey, might as well buy milk and cheerios and flashlight batteries and all the things that are 30%, 50% cheaper across the border. This is no help to the BC economy at all, quite the opposite. Next level up, since the tax there has been an increase of 4 million additional vehicle trips across the border per year. This is a huge cost in waste of gas, time, vehicles, and human energy. Plus I read that there’s now a side industry putting concealed fuel tanks on trucks so that they can haul an extra fifty gallons or so of fuel across on every trip … wouldn’t surprise me. You or your spouse or common-law partner can apply for the low income climate action tax credit when you file your T1 Income Tax Return with the CRA. On page 1 of your return, check the “Yes” box in the GST/HST credit application area. If you have a spouse or common-law partner, be sure to complete the information concerning your spouse or common-law partner in the Identification area on page 1. Include his or her net income, even if it is zero. Enter his or her social insurance number if it is not on your personal label or if you are not attaching a label. To receive the credit for your children under the age of 18, they must be registered for the Canada Child Tax Benefit (CCTB). If your children are not registered for the CCTB, complete the Canada Child Benefits Application form (RC66). You can also request the CCTB form by calling the CRA at 1-800-959-2221. The eleventh cost is official hypocrisy. One surprising thing I found out in researching this is that the good burghers of BC have fields containing evil natural gas … and even more coal. They don’t use much gas or coal themselves, in part because they have plenty of hydroelectric power. So although they personally dislike those nasty black fossils, they are all too happy to make a living selling them … the industry paid $1.3 billion for the use of the resources, and spent $6.7 billion on exploration and development. Total value of the fossil fuels exported from BC in 2010 was nearly ten billion dollars, about a quarter of their total exports. And to my surprise, seven billion dollars of that was from exporting coal. Big coal bucks, in other words. So the BC folks are not too proud to take stacks of evil coal money, and thus be totally complicit in the extraction and use of fossil fuels, because as long as other people burn the fuels they can wash their hands and feel all pure … dang, you know this public expiation of BC carbon guilt is starting to make more sense. What I hadn’t realized was that behind the facade of forest green, BC is a big-time coal baron. Funny how sometimes it takes me so long to finally wake up to some important part of the puzzle … in any case, of course they need to rid themselves of that secret shame, so it’s no wonder this particular carbon-taxing scheme could be sold there. They can get rid of their guilt that way. Wow, Willis. Stunning. You had me hanging on every word – and I’m Australian. The sooner people – and I mean regular, ordinary citizens – wake up to this the better. The pushers of these crazy schemes are getting away with it because people are sitting back and letting it happen, and they’re doing that because they don’t know it’s happening the way it is! Keep up the good fight. I enjoy your articles. Cheers to you, I’ll have a beer in your name. It just goes to show that they have been successful in removing the “EVIL” carbon from BC, what more proof do you need? It’s no suprise that so many politicians are lawyers, when you consider that the group of people most likely to benefit from any legislation are the blood sucking leeches of that profession. Leakage is always a problem with taxes. Increased importation of cement is a good example of leakage. Governments never learn (NEVER! ), that if you want more of something, reduce its taxation. If you want less of something, increase its taxation. Putting a tax on everything (ala a carbon tax), means you really want less of everything. BC is the most hippified part of Canada. I once read a leader article in an Alberta (the province next door) newspaper about 15 years ago, which sums up BC’s problem with getting to grips with reality. I promise you this is true: the article was berating the Alberta government for not paying more unemployment benefit, as it was ‘forcing’ all these people to relocate to BC, where the benefits were more generous and the climate was better. Much of BC is truly beautiful, but you do not want to try and start up a mining or an industrial project there, the Ecoloons will make it almost impossible. Maybe they’re exporting the coal with a requirement that it not be burned. (Also please note that these points don’t apply in Norway). It seems that Governments just do not learn from history. My thoughts turned to England in the 18th and 19th century where many goods were taxed at very high rates. This was also one of the causes of the American Revolution. Smuggling became very big business in the South East of England. It became so big that smuggling missions were financed by big business. While it became cheaper to buy smuggled goods, the legitimate goods were not being bought so people lost their jobs, businesses went bankrupt and of course very little taxes were collected. In the case of BC the citizens are doing legitimate smuggling. They drive to Washington or Alberta to buy their fuel and while at it buy other goods. In the meantime the businesses who stay lay off staff and eventually fold and the government actually loses money by collecting less tax. Einstein was 100% correct. Human stupidity is infinite. B.C. has the crud. the crud is like the reverse midas touch where everything turns to sh!t. B.C. has squandered so many opportunities and destroyed so many budgets that they are hardly distinguishable from California. Only 15 miles per gallon! If that’s your car, you’ve chosen it particularly badly. Its taxes like these that are supposed to be driving people towards greater efficiency and 15 miles per gallon is just awful! Peter Miller: Alberta is funny that way. They found the best way to increase a person’s income, while on welfare, was to cut welfare payments. It was found that many recipients on welfare went back into the workforce after the welfare cuts. The average increase in income was over 100%. And that memory thing that Willis talked about? Totally true. Don’t trust it. The average increase in income was 40%. It’s not just BC enjoying great coal export earnings. The US of A is laughing too as it fights the ’causes of climate change’ and relieves itself of carbon guilt. While there carbon emission go down, their coal exports go up. This is how to ‘fight the causes of climate change’. No wonder the Earth as a whole sees co2 levels continue up and up despite billions being spent on fighting eeeeeevil co2. What a bloody joke. To avoid any confusion the last on is just for Australia. Another aspect of this tax is school boards have to pay for that tax when they heat their schools. The added expense has forced those school boards to cut programs. The point is poor people rarely “choose” their form of transportation using whatever is available and functioning at any given point in time. Nice, detailed analysis. You could have stopped with the fact that politicians get a big pile of money that they are genetically driven to give away several times and need to expand their bureaucracy to handle. I drive a 1997 Lincoln Mark VIII and it averages about 17 miles per gallon in the city. I could buy a Prius for $32,000 and get 45 miles per gallon. Instead I bought my Lincoln for $700. That is a saving of $31,300. I use about $1500 in gas per year. So by purchasing the Lincoln I can buy twenty years of gasoline for what I saved in the purchase price. Best of all no one had to make another car. What about the handyman running an older pickup or van? It’s the only thing he’s got that can hold all his tools and stuff, and no way he’s going to spring for a brand shiny new $50k vehicle. Don’t forget a lot of those old 70s vehicles, still on the road, were burdened with first generation anti-smog crap that cuts mileage even more. Don;t kid yourself, there are a LOT of people in the barely-getting-by mode. Used smaller vehicles command a premium, and thus are still unaffordable for many. If you barely make enough money to buy food you don’t really have the ability to buy anything better. And all the tax will do is drive you to being unemployment. Cars can be very personal and are often not chosen for their functionality, nor because they make good sense. New large cars are more fuel efficient, but old small cars can be quite economical because they are far lighter than today’s counterpart. I have an old Lancia, almost 50 years old. Kerb weight is 810kgs. 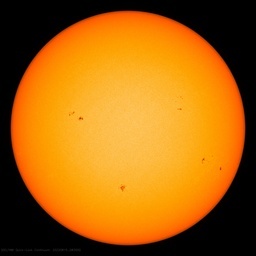 Mine is slightly lightened and is probably about 780 to 790kg. It has a 1.6 engine producing about 140bhp. On a run it returns about 30mpg. But if I drive it economically, i can get 45 mpg. I have a modernish VW Golf GTI, its economy is no better (probably slightly worse) and it is far slower (not top speed but acceleration and general point to point driving in country lanes). In the 1960s you could buy a FIAT Arbarth with Zagato body with a 1 litre engine. Top speed was just under 130mph, 0 to 60 in about 6 seconds with typical economy of about 60mpg and you could eek out over 70mpg. Mind you, it weighed in at under 500kg. So just as economical as the sporty looking SMART coupe, and far more Va Va Vroom. The other big plus is that it is drop dead gorgeous and appreciates in value. Willis, many good points. This is the problem with Government. Often about 70% of money taken in is just absorbed in the cogs of the machinery collecting the money, deciding what to do with it, impelementing policy, overseeing and auditing policy and its implementation. Very little gets to front line services. This is why government needs to be scaled back. It is very inefficient and should be as small as possible, leaving people with more money in their pocket to spend as they wish. You are right the energy should be a s cheap as possible. It is mad (and bad) to have a policy that makes energy as costly as possible. The search for tax revenue to perpetuate the vote buying machine never stops. Canadians can be the nicest most laid back people you’d ever want to meet. But man, they are suckers when it comes to taxation. They fall for the revenue neutral line over and over again. It’s the gift that just keeps on giving in Canada. When will people know this simple rule: there is no such thing as a revenue neutral tax. Period. How many politicians and policy makers have ever truly been in this situation? Or are their memories that short? You forgot one. All taxes go into general revenues so once it is collected you cannot determine where it came from nor what it was intended for. Gas taxes are supposed to be for infrastructure maint. but almost none of it goes there as seen by the poor state of the roads. Growing up near Detroit, I can remember when Americans crossed into Canada to buy cheaper gas. My how things have changed. To all those who say that if you’re poor you need to buy a car that’s an inefficient gas guzzler then what utter rubbish! There are lots of cheap used cars around for all sorts of prices and you certainly dont need to be spending thousands to get a small efficient car. Get a clue? Really? You cant find a more efficient car for about the same price in your area? Really? To those who play the “They’re poor and cant make sensible choices” card, shame on you! Here in New Hampshire, when in a vindictive mood we will sometimes refer to our neighbor to the south as “Taxachusetts”. They in turn may return fire with their “Cow Hampshire” epithet which really hurts because, well in fact we don’t have nearly as many cows as we used to, but that’s a different story. Anyway, they have both sales taxes and income taxes, while we have neither, (with the exception of booze and cigs, but more on that later) which is sometimes termed “the New Hampshire advantage”. The result is that we get lots of people buying stuff here instead of elsewhere, which includes all the states around us. Even our “sin” taxes are lower than elsewhere, so people will load up on booze and cigs here as well. Border towns get the additional business boost of cross-border shopping. Ah, but there is a price to pay (never is a “free lunch” actually free), and that is that our beautiful state has to make up its income from elsewhere. In part, it gets it from the sale of booze, by virtue of its state liquor stores, and the fact that only they can sell hard liquor. It nickles and dimes its citizens right and left, so if you need to blow your nose and it involves the state somehow, it’s gonna cost you, and probably more than you’d think. Then, whatever responsibility, most notably education that the state has, it will to whatever extent possible pawn off on the towns, meaning property taxes. Now, not all towns are created equal with regard to property. The discrepancy in fact can be huge. So we have the spectre of property-poor towns, with both a high property tax, and yet still struggling to keep education standards at a bare minimum. Neat, huh? Taxes. Can’t live with them, can’t live without them. Where did you dig up this strawman? Who claimed they can’t make sensible choices? For many the sensible choice is to keep the only vehicle they have, despite its poor mpg, rather than the choice to not go to work. Many of them can’t buy any car and are stuck with the car they have. Finding the cash up front may be difficult (even just a few hundreds for some folk) but when the payback period is measured in just a few weeks for those that have to travel a bit, then its worth finding a way. Thanks, but there are a number of us who oppose these kinds of taxes and realize what they are. Getting more revenue. A lot of the voting public are what American’s call “Pinkos”, Socialists, verging on communist. They want the government to provide more and more free stuff that the rest of us have to pay for. Nice we may be, but many are incapable of taking responsibility for their lives and want the government to run it for them. They call it “progressive”, but greedy actually when you think about it. Increases in taxes are quire regressive when in excess, like this. BC has one of the worse concentrations of such people. What a wonderful series of articles you’ve written Willis. Thank you for your efforts. If the Canadian media had any backbone, they’d be knocking down your door to ask to use your work. Sadly, the media like the people up here are a bunch of robots that never question the propaganda they’ve been programmed with. Are you aware of Obama’s “Cash for Clunkers” deal. It removed a hugh number of affordable used vehicles from the market in the US. A majority were the vehicles that the lower income would have stepped up to. Very few of the so called clunkers were actually clunkers. They were the vehicles driven by those who could afford to purchase a new car. Every supporter of that sorry legislation should be imprisioned. Tim, I think the point is that you shouldn’t fall into the trap of blaming the poor, or less-well-off for their own poorness. That’s the “let them eat cake” mentality. If someone is driving a lower-mileage vehicle, there is probably a good reason for it. Yes, poor people can and do make poor financial decisions, just as many people do. However, the consequences for them are going to be worse. When speaking of BC a distinction should be made between what is called The Lower Mainland and the rest of BC. Most of the hippies, socialists and global warming scaremongers are concentrated in Vancouver and Victoria along with most of the population. The rest of us are logging, mining and pumping oil and gas like crazy. Hippies make six figures where I live working in mines or the oil patch and keep their opinions to themselves. As informative as this post, and many of the reader comments, is, it offers no solution. The fundamental problem at the root of the B.C. carbon tax scam, and many other injustices, is that “government” is, as almost always in Western democratic societies, as a faceless, nameless, unstoppable force, for which no one is to blame except its victims themselves. The reality, so diligently, unceasingly, and successfully obscured by the mass media, is that all government, at every level consists of people – ruthlessly lying, cheating, thieving, brutalizing, murderous people. Many of the depredations they visit on their “constituents” are crimes punishable by years of imprisonment, or would be, if the courts and police were not an integral part of the machinery of exploitation and repression. And, lest we forget, the police, the courts, the legal profession and all their support organizations consist of people too. The real genius of democracy as we live it turns out to be to make the ruled feel responsible for their own misfortunes, and the tool that makes this possible is the lie. Until and unless humanity finds a way of purging government of liars, our civilization is doomed to extinction, because the global funeral pyre that Adolf Hitler dreamed of but lacked the means to assemble, is now well within reach, and can now be ignited by multiple pathways without any need for a megalomaniac dictator. To quote Arnold J. Rimmer, “Wrong! Wrong! Absolutely brimming over with wrongability!” We’re helping out a, well, I’ll just call him a “family friend”. All we’ve got to let him use to get to work is my old race transporter. So if he’s gonna get back and forth to work, he’s got to do it in a 2000 V8 Dodge Ram Van. Sub 10mpg. That’s it. The only thing available. He can’t buy a “cheap used car”. He can’t buy any car. There is no room, none, zero, zilch, nada – left in his budget. Whenever I use the van I always get it with the low fuel warning light on. He can’t afford to keep gas in it. Willis is right. And you’re dead wrong. There are tons a people out there to whom $100 is big bucks. Economically speaking, this isn’t true. Decision making is based on marginal costs, not averages. If an average person consumes 100 widgets a year, and you impose a $1 tax per widget while giving everyone a check for a fixed $100, widget consumption will fall. The individual’s behaviour doesn’t impact the fixed $100 received, but it does affect the variable amount of tax paid. The $100 rebate will be spent on all sorts of goods, services or savings, not just on widgets. The people running this province are idiots, especially that rube running Vancouver. You cannot build a vibrant economy with foreign trust funders. Nor can you build it by adopting policies that mimic cities of destitute people. If the government is for it, you should be against it here. So much stupidity, of which this is merely one aspect. If there is a more succient sentence than this one above,I sure would like to hear it. And as an after thought……isn’t “revenue neutral” an oxymoron? Oh, Tim, you’re so funny when you try to describe reality, it’s really cute. I just picked up a hitchhiker this morning; a man in his mid-twenties. He said the motor in his car blew up. He had only bought it a month ago, and he had to take out a loan to buy it. It was a 2004 Subaru. Great gas mileage, but it cost him $11,000 ! You call that affordable ??? The guy has no other debt or financial obligations so he could afford the loan; its a shame he got a lemon. The point is : if you think most people have thousands to spend on a reasonably young and fuel “efficient” automobile, you’re in wonderland ! The guy who but the Lincoln for $700 is a whole lot smarter ! Thanks, Russ. For optional stuff, “widgets”, you are likely right. But people have to buy what they need. For poor people, that’s gas to get to work. If you fine a poor guy $200 for using gas to gt to work and then hand him $200, he’ll likely put it into his gas tank because he has to get to work. ’nuff said about that level of stupidity. That sound you hear is $$$$$Big Bucks being flushed down the Great Greenie Gaia Crapper. Such a waste of taxpayer funds that could be paying for public healthcare, education, infrastructure etc. Massive new discoveries in the US have led to a “dramatic” change in global prospects. The IEA’s head of oil markets, Antoine Halff, says forecasts have had to be repeatedly revised upwards in the past two years. all they had to do was sit back while the BC Liberals sold BC down the river . David Suzuki most certainly doesn’t care how much he has to pay for anything. Everything he does and says publicly is self-serving, done in the name of the environment but of virtually no positive environmental consequences and always just all about David Suzuki. Most certainly he doesn’t care if he hurts poor people or not. Funny thing though. He just made the Immigration Minister of a very skeptical Conservative government that concentrates on tightening the immigration laws in Canada look very liberal thus gleaning a half a million or so new votes from the recent immigrant population. He told a French publication that all immigration to Canada should be shut down because Canada is full, the immigration policy is disgusting and allowing immigration to help build the economy is crazy. Guess he’s one of those Canadians who can’t read French , thinks the rest of us can’t and that Google translator doesn’t work in Canada. City taxes increased over 3 % a year since implementation. This does not include the cost of food and other products that require transportation. My cost for grocery items has increased $244.00 per month since 2008. A small increase in the tax has a huge ripple effect on the cost of goods. Clearly the real cost of this stupid tax was never considered. I wont get into the waste of hundreds of thousands of dollars on upgrading the school heating systems then closing the schools. Or the heating upgrades in schools that are in need of major renovations. This insanity just keeps going on and on. Shouldn’t Whistler get a a tax refund? Excellent, Willis – but the point can be made very simply: no tax can ever be “revenue neutral,” because even if the tax is 100 percent refunded to payers, there is still the cost of administering it,, which will come out of the taxpayers’ hide somewhere. Somehow we need to get the word out to all those low-income people who have been voting Kleptocrat about how they are being screwed by the Kleptocrat Party’s and der Fuehrer’s energy policies (among other things). For what it’s worth, Willis, I think this series is some of your best work, perhaps exceeded only by the Steel Greenhouse. The comment threads, too, are gold mines of information. Thanks for taking the time. 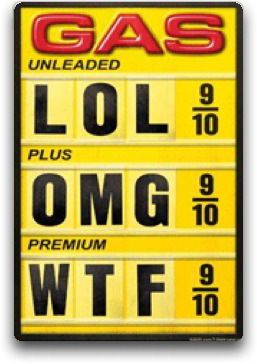 Agree, the impact of a gasoline tax boils down to elasticity…. how sensitive consumption is to changes in price. Your example of the poor guy spending $200 to get to work, while a realistic example of an individual with highly inelastic gasoline demand, isn’t representative of the entire population, and therefore is not a good model for how total gasoline demand would respond to price changes. Fortunately, this might be one of the most heavily researched areas of economics due to 1) the availability of price and consumption data, and 2) the obvious policy implications relating to fuel taxes. “It turns out that there are a lot of studies which calculate what the price elasticity of demand is. There seems to be at least 100. Fortunately there are two good meta-analyses which examine the work of many different studies on the matter. One such study is Explaining the variation in elasticity estimates of gasoline demand in the United States: A meta-analysis by Molly Espey, published in Energy Journal. Espey examined 101 different studies and found that in the short-run (defined as 1 year or less), the average price-elasticity of demand for gasoline is -0.26. That is, a 10% hike in the price of gasoline lowers quantity demanded by 2.6%. In the long-run (defined as longer than 1 year), the price elasticity of demand is -0.58; a 10% hike in gasoline causes quantity demanded to decline by 5.8% in the long run. a) The volume of traffic will go down by roundly 1% within about a year, building up to a reduction of about 3% in the longer run (about five years or so). b) The volume of fuel consumed will go down by about 2.5% within a year, building up to a reduction of over 6% in the longer run. c) Efficiency of use of fuel goes up by about 1.5% within a year, and around 4% in the longer run. d) The total number of vehicles owned goes down by less than 1% in the short run, and 2.5% in the longer run. It’s important to note that the realized elasticities depend on factors such as the timeframe and locations that the study covers – the realized drop in quantity demanded in the short run from a 10% rise in fuel costs may be greater or lower than 2.5%. Goodwin et. al. find that in the short-run the price elasticity of demand is -0.25, with a standard deviation of 0.15, while the long rise price elasticity of -0.64 has a standard deviation of -0.44. Anyway, this doesn’t detract from the rest of your argument. I’m in agreement with you that carbon taxes such as the one enacted in BC tend to be inefficient at best and can be seriously harmful at worst. That said, the I’d still prefer a simpler carbon tax (or any broad consumption tax) to an income tax as it would be less economically distorting, but that’s an argument for another day. Another good piece, Willis! One of my Canadian cousins lives just three miles from the border crossing at Blaine, Washington, and she never buys gasoline in British Columbia. She drives her car, her husband’s car and their son’s car to Blaine to fill up. When I drove up to 100 Mile House, B.C. four years ago for a family reunion, I filled up a few hundred yards before the border crossing and I bought as little gasoline as I could get by with, and crossing back into Washington State with barely more than fumes in the tank. You are right. However, it is an excellent model for how the poor guy gets screwed by the policies you are advocating. Fascinating but immaterial. We both agree that if you tax something, people use less of it … your re-proving that doesn’t help. NO, NO, NO!! All taxes are NOT created equal. When people talk about a carbon tax, that’s code for an energy tax, but they don’t want to be honest about it. You are advocating raising the price of energy, and as a result you are advocating actively harming the poor, the farmer, the housewife, the environment, and the economy. How you twist that in your mind to make it a path you’d prefer over an income tax escapes me. Way back in ’98 I was invited to a friend’s wedding in Seattle. In ’96 federal speed limit control (the despicable 55mph national speed limit) was returned to the states. So Montana returned to its daytime speed limit free formula (although an unstated 100mph limit was likely to be enforced). Montana’s between Chicago and Seattle. So I drove. Unfortunately I left somewhat late in the day. Driving north through Wisconsin on I 90/94, then I 94, I noticed flattened red rectangular patches, the tip pointing forward, across the lane. Oftentimes the patch was accompanied by progressively smaller patches as if something had skipped along the road. Whatever were these, I thought? Then it dawned on me: My god these were deer hits! They were irregularly spaced, in both lanes, and continuing. And the red color was, well red: they were fairly recent hits. And they were everywhere. It was night out and if one jumped in front of me, well there wasn’t much I could’ve done. Years later, in 2005, I undertook a once in a lifetime drive to Alaska. However, time constraints required I give up the drive from Chicago. Instead we flew to Seattle, rented a car, drove north to catch a BC ferry to Vancouver Island, drove north along the island’s coast to its tip at Port Hardy where we caught another BC ferry to Prince Rupert where we caught an Alaskan Marine Highway ferry to Valdez. From Valdez we drove to Fairbanks and then back to Seattle. Anyway, about half the highway north to Port Hardy was a four lane divided, controlled access expressway. It serviced the quaint, touristy, waterfront towns on the protected east coast of the island. It would be an understatement to say that it was probably the nicest highway I’d ever driven on: glass smooth concrete, not asphalt; and, wonders, it had a game fence, both sides along its entire length. Game fences, you see, are the only way to positively guarantee against deer (or other large animal) hits, quite a few of which prove to be fatal to motorists. Game fences are, however, quite expensive, initially, and in maintenance. Which, no doubt, is why I’ve never seen them, before, nor since that drive along Vancouver Island, and certainly not along I 90/94. Why a game fence along this highway on Vancouver Island in British Columbia? Well, the capital of BC is Victoria to the south of the island. Victoria is quite an appealing place: a grand hotel or two with fine cuisine served on outdoor terraces; oysters on the half shell; fine shopping; art galleries; it’s own Crystal Palace. But, the hardworking public servants may wish for a change of pace, so on the weekends what better way to escape the tedious shopping in genteel old Victoria then to load the 1.8 kids into the family Volvo or Mercedes and zip on up to one of those waterfront towns for a weekend get away. And, along the nicest road the taxpayer can supply to them. Maybe I’ve been long winded here. But maybe I’ve made my point. Those carbon (oh, how I hate that shortened term)taxes are not for our welfare. So, in the end, they’re not going to be revenue neutral. Because, if more common folk slow down traffic on that east coast highway, the public servants may just need to build some heliports: a little more expensive then game fences. First. People who don’t have a lot of money purchase a vehicle that they can use most of the time. For a family, that means buying something that will carry all of them, and maybe one or two more, which usually means a minivan. Minivans get a premium price in the used car market, but you can get a used full-size SUV or van for really cheap, so around here, you find the poorest families in big SUVs and full-sized vans. Second. Vehicles that get really good gas mileage sell for premium prices in the used car market. Even a 15-20 year old Sprint/Metro/Swift can sell for over $5,000, if it is in decent (safe and reliable) condition. Third. Payback time in a few weeks? Do the math — then adjust it to a real-world scenario and do it over. Four. Poor does not equate to stupid. If they could make it work, they would, but they can’t so they make do with what they have. An important one you missed out on is if you are living under a bridge or in your car (absolutely the poorest) you probably can’t claim a rebate – you can’t claim other tax credits or anything unless you have a bonefide address. So I guess you would also have to illegally pay something to someone with an address to get your cheque. Another group I didn’t see mentioned that gets screwed by the carbon tax but fortunately can pass it along if the competition allows is contractors. There is no real fuel-efficient substitute for the 1/2 ton pickup truck. Yeah, Russ, those poor people all have degrees from the London School of Economics, the scallywags. As a word mechanic, I love “porkoisie.” Excellent. Descriptive and pithy. As The Godfather demonstrates, society abhors a vacuum. If you build it, he will come. He may already be here. If your car is also your home as is the case for many out of work poor it is often necessarily large. Often not a car, for that matter, but a van. A beater, certainly, run down, no money for maintenance, if in the midwest then very likely full of salt rot from the highways and and wet grassy lots they have to park on. If the driver/occupant manages to get ahead that van is recycled into another rolling castle for another lost soul. In the USA, the central planning, redistributionist big-brother statists claim these schemes are revenue neutral because the money will be used to fund more government services. Yep, they claim the people get the money back — not as money, of course, but in the form of bigger government. You have given much argument for energy taxes. Have you considered another option? No tax. Makes life much more simple. “NO, NO, NO!! All taxes are NOT created equal. When people talk about a carbon tax, that’s code for an energy tax, but they don’t want to be honest about it. You are advocating raising the price of energy, and as a result you are advocating actively harming the poor, the farmer, the housewife, the environment, and the economy. I’m happy to call a carbon tax an energy tax and be entirely honest about it. And yes, the burden of an energy tax falls more heavily on the poor. No disagreement there. I’ve read your previous posts on this subject. I greatly respect your analysis, and I have only minor disagreements with your reasoning. But by looking at the alternatives, I come to a different conclusion than you do (although it’s ultimately immaterial because I end up opposed to the carbon tax for an altogether different reason). Let’s begin with a simple statement: As North Americans, we overconsume. I’m not talking about in relation to what the planet can sustain… that’s an ecological argument. I’m making an economic argument…. we overconsume relative to what we produce. Now in the short run, our overconsumption is not necessarily a problem. An individual can consume more than he/she produces for short periods of time… virtually all of us consume significantly more than we produce on weekends. Most individuals are net consumers for the first 2 decades of their lives, and again for most of their senior years. But as much as we might like to, we can’t do it forever. Overconsumption, or living beyond our means, can only be maintained by A) drawing down capital, B) running up debt, or C) living at somebody else’s expense. As a North American society we’ve been living beyond our means for so long that we’ve long exhausted our capital, we’ve spent the last few decades running up debt, and since we’ve got nobody else who’s willing to fund our overconsumption, we’re handing the bill to our future generations as “unfunded liabilities” simply because they have no say in the matter. Why do we overconsume? As you wrote: “We both agree that if you tax something, people use less of it “. This applies to labour as well… if you tax employment, people will work less. If you subsidize unemployment, more people will remain unemployed (i.e. we will underproduce). If you tax savings and subsidize consumption (which is being done by inflating the money supply and artificially lowering interest rates), people will consume more today and save less for the future (i.e. we will overconsume). None of this is particularly controversial, so our collective propensity to consume more than we produce should come as no great surprise. But let’s focus specifically on the income tax. By taxing people more, they work less. Not only does the income tax distort behaviour resulting in economic losses, it is extraordinarily inefficient and intrusive. An ideal tax would have zero administration cost… such that every dollar paid by taxpayers would be available as revenue. The income tax is far from that. The compliance costs are astronomical. The IRS has over 100,000 employees, and every firm I know employs people for the sole purpose of navigating the maze of income tax regulations. Countless accountants, lawyers and tax preparers do no productive work whatsoever… 100% of their labour being allocated to compliance activities. Worst of all, the income tax gives the government license to track your personal activities, savings, investments, expenses, and confiscate your property without due process if they’re displeased. Additionally, the income tax code is a tool for politicians to meddle in people’s lives and business affairs, reward their backers and punish anyone they don’t like. In my opinion (and people can have different opinions on this) the income tax is the most economically destructive form of taxation currently in use. On every measure that you assessed the carbon tax, apply the same evaluation to the income tax, and I expect you’ll find it to be even worse. In my ideal world, I would fund government through 1) user fees, 2) taxes on land value, and 3) consumption taxes. User fees are the most economically efficient, since the individual paying the fee is the one receiving the benefit. For public goods, (according the strict economic definition) , the land tax is the least intrusive (land doesn’t go underground or leave the country to avoid taxation). And in extreme situations where the first two options are inadequate, leaving short term revenue/spending imbalances (e.g. WWII) consumption taxes would help plug the gap. And I’d argue that today’s accumulated overconsumption gap is an extreme situation in serious need of plugging. Getting back to overconsumption, there are only two goods that I know of where the seller of those goods spends their advertising budgets imploring their customers to buy LESS of what they’re selling. Those two goods are electric power and municipal water. There is no surer sign that the “market” prices for these goods is too low, encouraging overconsumption. So, we’re already in a situation where we overconsume energy relative to what we would consume if it was rationally priced by an undistorted market. To the extent that a carbon tax flows through almost every good and service in the economy, it effectively serves as a consumption tax. Since it would impact the poor more than the rich, I’d over-rebate it up to the poverty level, basically giving very poor people an additional source of income, over and above what they would have to spend on the tax. Anybody above the poverty level would have income tax savings to offset their higher consumption tax payments. So, I would prefer a consumption tax (even in the form of a carbon/energy tax) to the income tax. Ultimately I’d rather efficiently tax something that’s either negative or neutral (pollution/ carbon emissions/ energy use), than inefficiently tax something that’s a positive (productive employment). Now, in reality, the government will almost certainly pull a bait and switch… offering a “revenue neutral” carbon tax, offset by income tax reductions, but in time, the income tax rates would inevitably rise back to where they were and the carbon tax wouldn’t go away. So, while I think paying a carbon tax would be better better than paying an income tax, the worst case (and most likely) scenario would be paying both. And ultimately, that’s why I oppose the carbon tax. ….. Let’s begin with a simple statement: As North Americans, we overconsume. …. ….Getting back to overconsumption, there are only two goods that I know of where the seller of those goods spends their advertising budgets imploring their customers to buy LESS of what they’re selling. Those two goods are electric power and municipal water. There is no surer sign that the “market” prices for these goods is too low, encouraging overconsumption…..
Sir, I would not call you ignorant. You clearly are not. But you are clearly misguided in what you wrote in the above comment. Face it, you love energy taxes and water taxes. How often would you recommend that I shower or brush my teeth? Should I skip every third day of work? When I’m down to the wire, would you please advise me as to what would make you happy. Willis the way you put things just cuts through all the garbage and gets straight to the issue. I can see Australia going the same way soon. The idiots in Canberra can’t just use their brains and realise that it’s all a scam. No, there are other alternatives. The $200 could be spent on a hybrid car or diesel rather than a conventional car. (The use of diesel fuel has risen despite the carbon tax on it.) Or spent on living closer to where you work. Best of all, the choice is up to you, not the government. An average American car is driven about 10,000 miles a year, gets perhaps 25 miles to the gallon and therefore currently costs $1,500 to fuel. If a new carbon tax doubled the current cost of fuel and you received a $125 rebate every month in the mail, would you spend it all on gasoline? Forever? If you drive a old pickup truck, you’d be paying an extra $3,000 per year and only getting a $1,500 rebate. Wouldn’t you changing to a higher-mileage vehicle? If your business truly demanded that you drive a pickup truck, you’d have to pass the added fuel costs onto your customers. Willis your expose of the lunacy of the BC taxing, mirrors that of the reality of the present Labor governments taxing charade in Australia. It is the economist’s dream, the money churn, just make the money move faster through many hands and it will naturally do good for someone, just needs the addition of a good old Mafia Casino skimmer to cream off percentages as the system leaks under the increasing pressure of maintaining its perpetual motion, the indulgences and spin, to salve belief and, an army of bureaucrats inventing new ever increasing sub taxes and bankers and spinners creating the propaganda. Where does it end – when the poor are so poor they are no longer useful fools and they become revolting? or dare I say it, start asking questions – why is it so? I don’t “love energy taxes and water taxes”… I just hate them less than income taxes because they’re less damaging. So if I was forced to choose between a consumption tax or an income tax, I’d go with the consumption tax. Ideally, I’d go with neither (and pay for the government with user fees and property taxes). I’d recommend you cut back on the car washing, lawn watering or swimming pool filling before cutting back on personal hygiene… but that’s just my opinion. If you’re still short on funds, I’d suggest you try working more, instead of skipping every third day. What would make me happy would be if we all simply paid the fair market price for what we choose to consume, rather than insisting that our consumption be involuntarily subsidized by others. TANSTAAFL. I live in the center of BC so cannot take advantage of crossing the border into the US or Alberta for cheaper fuel. Generally in the interior of BC we have to travel long distances between towns or for general travel so get hit hard by this tax. Natural gas for heating is also taxed and since temperatures in a lot of the interior are subzero in winter we get hit hard unlike Weaver or Suzuki and their ilk who live in LA LA land on the coast. Thanks Weaver for the tax, you are a charm. If you are a rancher or miner or oil patch worker with a welding rig, you probably own a one ton truck either in single rear wheel or dually configuration. Those of us who work in the hinterlands have a truck or 4×4 of some sort to get our work done. I have four – a 74 Jeep Cherokee, a 1990 Ford 3/4 heavy duty 3/4 ton, a 2010 Hyundai Sante Fe, and a Dodge Ram one ton dually for hauling livestock, equipment and hay. You won’t see any Prius’s out here on the gravel freeways. (well not in running condition anyway) 😏 Great articles Willis. Oh yeah, driving 10,000 miles a year would be find for city folk. My dually is a year old and has 16,000 miles on it, then add the miles for my other vehicles and it’s more like 40,000 miles a year – course in my case it’s 50 miles round trip to town which is pretty common around here. My neighbour drives over 100 miles a day to get to work and back in his truck. Excellent, and thank you for the clarification. “Overconsume” is an emotional word. A more neutral way to put your claim is that we consume more than we produce. That’s entirely measurable, both in the short and the long term. In the short term it’s called the “Balance of Trade”. It’s calculated as how much we export minus what we import. Yes, the US has run with a negative balance of trade for a while, meaning we import more than we export. But that’s not “overconsumption”. We have to spend of our national wealth to pay for the things we import. So in the long run, a negative balance of trade just means that the economy will grow more slowly. So when the imports are coming in that you seem excited about, there is an equal but opposite flow of money going to people in other countries. 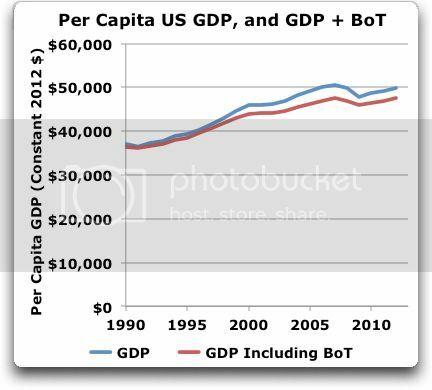 As you can see, current per capita GDP is almost exactly $50,000 (in worthless 2012 currency). Of that, we produce $48,000, and the other $2,000 worth we pay for. So no, I don’t think the problem is first world overconsumption. The problem is third world underconsumption. As I said above, I want to see the world use MORE energy, not less. That’s the only hope for the poor. That’s the only path for developing countries. That’s the only safeguard for the environment. More cheap energy is what we need, not first world pearl-clutching while raising energy prices. You raised an interesting issue, I always learn something in the comments. No, there are other alternatives. The $200 could be spent on a hybrid car or diesel rather than a conventional car. Frank, that’s hilarious. A poor guy gets $200 and he spends it to purchase a Prius? We gotta keep you for the entertainment value alone. Of course we do have Abbott, he might be using his brain, but I’m really not sure. He just called carbon trading the non-deliverance of an invisible substance to no one. But he still has his own direct action plan, whatever that means. Although I’m sure it’s better than whatever Rudd is going to do. The only thing that concerns me now is that I think Rudd has a good chance of winning our next election. Your Point 2 is incorrect. Suppose there are two goods: energy and all other. You put a 10% tax on energy. You also give the individual a tax refund such that he or she COULD consume the exact same bundle of energy and other goods as before. Will the individual consume the same bundle as before? No, because the price of energy relative to other goods has gone up. To maximize utility the individual will substitute away from energy to other goods. And, therein lies the folly of your reasoning about carbon taxes … the entire false economy of ‘renewable energy’ and ‘green’ industries that exists only because they are heavily subsidised at the expense of the consumer. I agree with all who took the Tool Man to task for his incredible ignorance of what it is like to be poor. Tim, perhaps you should try it for a few months. A second point is who gives anyone the right “to be driving people towards greater efficiency..”? That is the purpose of the free market. When a bunch of elite government bureaucrats and greedy politicians “drive people” to do anything they are abridging the peoples’ freedom and wasting time, money, and peoples lives for their personal enjoyment of tyranny. Less government and free market is the only to help the poor and everyone else. How could you read Willis’ BC articles and not learn anything? Votes since then have been more about pro-business versus pro-socialism than carbon tax versus cap-and-trade. The best example of a country that thrives on oil money but hates CO2 is Norway. But what if that energy is the energy to get to work? The same amount is needed before and after the tax, so the individual will have to consume the same bundle. Your point only works when part of the bundle is discretionary. But when the whole bundle is necessary for survival, then your point falls apart. And that is exactly the situation with the poorest people. Which is exactly the point being made about how it penalizes the poor. Then add to that the fact that the added cost of energy will add to the cost of just about everything else. Causing the rest of the bundle to increase also, although probably not by the same amount. Yeah, you can chose to save up that $200 until you can buy a newer car with better mpg. Of course while you do that your lack of gas for your current vehicle will prevent you from getting to work, so you end up with no job. Or you can save up that $200 until you can afford the deposit for a place closer to your job. Of course while you do that your lack of gas for your current vehicle will prevent you from getting to work, so you end up with no job. So you can chose what road paved with good intentions you will take to hell. I have only a few minutes before I need to burn energy to get to work. It takes the same amount daily. But first let me cover your suggestions with regards to my municipal water use. My transportation is a 1988 Jeep with much faded paint. No need for washing here. I do not have a pool. I do not water the grass. I do take quick showers daily. I do give the dogs fresh water daily. I turn the water off while brushing my teeth. Please advise where a higher water utility bill would cut my consumption. As far as fuel. My vehicle requires a given amount of fuel to travel to work. How would an increase in costs change this. I have long ago cut consumption of any recreational fuel use. I’m sure that contributed something to the shrinking of the economy. As far as heating oil goes, my programmable thermostat is set for 48 at night and never has the temp in my home been above 60 throughout the heating season. Think I should squeeze it a little more? I had hopes for a later model vehicle but “Cash for Clunkers” stopped that. You complain of paying $100k in income taxes, well I wish I had an income to require that. You seem to be sold on the idea of more taxes and higher costs, just less income tax for yourself. I would agree that there are too many taxes but I’m not sold on more taxes in different forms. Willis, this is Canada. Give someone $200 and they’ll first go buy a case of 24. (beer that is) Then complain they dont have enough money for gas. Former Calgary councillor thinks the unthinkable in the heart of oil country. If I was consuming more than I produce, I wouldn’t have any savings or retirement accounts. OTH, my government consumes far more than it produces. In fact, that was a moo point (it’s like a cow’s opinion, it’s moo) because government doesn’t produce, it only consumes. Everything the government spends comes out of somebody else’s pocket. Any fee, tax, service charge, etc., comes out of somebody else’s pocket. It’s all money that could be spent on something else. Many times, it could be better spent on something else. Our government rarely spends wisely and is a drain on the private economy. This point is completely standard textbook microeconomic theory. Your comment is a factual one: do people actually substitute away from energy when the relative price of energy rises? The statistical evidence here is clear: they do. Russ R was citing numbers for the price elasticity of energy demand earlier on this thread, and that is just one example. Table IV shows electricity price elasticities by income group: the price elasticity for the poorest quarter of the population in that study is actually higher than for wealthier groups. Lastly, it may be that you are making a moral argument: that the poorest people SHOULD be protected from the hardship caused by higher energy prices. If so, I am 100% with you on that. Yes my point is fact and your point is theory. Fact wins. The data Russ R cited covers a large group of people covering vastly different individual economic conditions and then averages their responses. Meanwhile reality and facts are clearer than statistical evidence(which is just an amalgam of responses), some people can’t susbstitute away from energy without losing their jobs. “You also restrict your case to that of the “poorest people”. Well since the article we are comment on specifically mentioned the affect on the poorest people I felt that following the authors argument would be the correct path. I don’t know, ask the article’s author. But it seems you feel that if most people can live with the change then screw the poor people. If you have electric heating or cooling you can adjust your usage of them in response to changes in electricity costs. But if you don’t have them then you can’t adjust your usage based on cost. From your own cited source, Yes there is evidence that the poorest people do not respond to price incentives. So, in a similar manner if you make vehicle trips that are discretionary, you can adjust your driving habits based on changes in fuel cost. While if virtually all your vehicle trips are necessary for your economic survival then your fuel usage is set and can’t be adjusted based on fuel cost. First off, since I don’t know where you live, I don’t know whether your municipal water is being underpriced and subsidized or not. I do know that where I live, the municipality owns the water system and for years, the meter prices didn’t come close to covering the system’s operating costs, let alone its capital costs. As such, the utility ran at a loss (paid for by taxpayers), and consumers didn’t think twice about their water consumption, because it was so cheap. The city’s water infrastructure was in serious disrepair, and there were chronic water shortages (with the city begging residents to use less water). I’ll point out, this wasn’t an ecological issue… I live on the shores of one of the largest freshwater lakes in the world, so there’s no local scarcity of water. It’s merely an economic issue, the cost to treat the water for municipal use exceeded the amount being charged to consumers, resulting in a serious market imbalance. Then the city smartened up. They’ve gradually raised water rates from $1.23 per cubic meter (1000 liters) in 2004, to $2.86 per cubic meter today. That’s still ridiculously cheap for household use (around 57 cents a day for the ~200L used in drinking, showering, flushing & washing), but it gets rather expensive to refill a swimming pool (around $430 for the 150,000L to fill a 10m x 10m pool to an average depth of 1.5m). The results haven’t been surprising… average household water use has fallen, and not because people are taking fewer showers. Nobody’s asking people who are using 200L a day to reduce their household consumption further. But I am asking them to pay a fair price for what they’re consuming without being subsidized by taxpayers. The consumption reduction happens at the upper end, where people refill their swimming pools once a month instead of every second week, because they’re having to pay the actual cost of their water. So, if your municipal water is already being “fairly priced” rather than being subsidized, then I’ve got nothing to say. But if you’re getting subsidized water, and if you’re going to complain that your 57 cents of daily water use is too expensive, you’re not going to get a lot of sympathy from those who’s income taxes are subsidizing your water use. I’d tell you to try producing more if you want to consume more. TANSTAAFL. Most people just want to be left alone, do their business, they pay their taxes and make a living. That has to be the funniest appeal to authority I have ever read on here. Isn’t the entirely fictional supply and demand curve standard textbook economic theory? Maybe that’s the problem, economists are not just into hockey culture, they invented it. No, not an appeal to authority, just an observation. My second post argued that the statistical evidence is fully consistent with the prediction from economic theory. Critics of climate alarmism are of course free to reject both standard economics and statistical evidence. It just wouldn’t reflect too well on them. And you are of course free to use statistical evidence when dealing with individuals. It just doesn’t work and doesn’t reflect well on you. The annual Balance of Trade isn’t the whole story. The BoT only looks at what crosses borders in the current period (the annual delta between what we produce that others consume, and what we consume that others produce.) As you wrote, it’s only the short term. Beyond current imports and exports, there is a temporal dimension to production and consumption. We can also consume in the present whatever surplus we ourselves have produced in the past (drawing down capital), or we can consume in the present and give up some part of what we will produce in the future (accumulating debt). Can you see any other way to explain the enormous accumulated indebtedness of Americans other than decades of living beyond their collective means (i.e. overconsumption)? (I’m not picking on Americans here… Canadians aren’t much different, except that their data are less readily available). “The problem is third world underconsumption. As I said above, I want to see the world use MORE energy, not less. That’s the only hope for the poor. That’s the only path for developing countries. That’s the only safeguard for the environment. More cheap energy is what we need, not first world pearl-clutching while raising energy prices. And here, you and I are in COMPLETE agreement. Like you, I’ve spent a decent amount of time in developing countries, and have seen how the poor suffer from a lack of basic electricity and water, and the impact this has on the environment. The best thing for both the people and the environment would be to increase everyone’s level of economic well-being. Reliable, affordable power and water are critical elements of prosperity. But an carbon/energy tax in British Columbia does not raise the prices of energy in Tanzania. On contrary, reducing overconsumption in the developed world would make many global resources more affordable, allowing increased consumption and greater prosperity in the developing world. Anyway, it’s truly a pleasure chatting with you Willis. If you’re ever in Toronto, you’ve got an open invite to continue the conversation over the beverage of your choice. I just finished up my day burning energy to get home from work. Checked my water bills for the past 9 months. Total cost was $271.85 US. I consumed 847 gallons. Considering 30 days to the month it averages out to $1.00 per day. Not so bad being that I am in a single household. You have a real deal at $0.57/ day. My use is about 28.2 gal per day. I doubt that I could consume less. 28.2 gal/day which would be 106.6 liters/day. So to do a little rounding off, I seem to be paying twice as much for half the water. That’s close to a factor of 4 times the cost of your water. The best part is that new EPA regulations effective July 1, 2013 will now add another $60 to $80 annually to my bill to improve storm drains to stop run-off to the local river (green reasoning). Same run-off as always but it’s claimed to protect water quality. Seriously think about that for a moment. By the way, my roof drains are directed to my back yard and in the heaviest downpours only flow a couple of feet. Enough said on this subject, but I wanted to respond to your comment that municipal water, as well as energy, was too cheap. Sir, the same shoe doesn’t fit every foot. I rest my case. I would advise you to petition your local governing body to cease any maddening taxes that you abhor. Don’t roll over and accept more taxation in any regard simply because you accept more taxes. Oh, man, you were doing so well, and now you’ve put on your preacher’s sackcloth again and come to tell us of our sins of overconsumption … Russ, YOU DON’T GET TO DECIDE WHAT IS OVERCONSUMPTION!!! My advice would be to stop using the word entirely, it’s a word of biblical judgement, not an economic statement. And in any case, consumption is not the problem, the problem is lack of production. The issue is not that BC is using too much gasoline, it’s that Togo is not using enough. And meanwhile, millions of tons of BC coal are being happily burnt, just not in BC. How is that a solution to anything? Sadly, that’s just a demonstration of hypocrisy—mining and shipping coal but claiming to be cutting down emissions? Sounds good, my friend, if I get that way I’ll give you a shout. I suspected the same at the time, I just found it ironically funny, which is why I posted it “without comment”. When B.C. Premier Christy Clark sits down with her fellow provincial and territorial leaders Wednesday, she might trumpet her government’s carbon tax success at what many critics said was impossible: reducing fossil fuel consumption without damaging the economy, the author of a new study suggests. Elgie is chair of Sustainable Prosperity, a national network of economics and environment professors funded by the Social Sciences and Humanities Research Council. Sustainable Prosperity has released a report that shows since the carbon tax shift was introduced in 2008, B.C.’s consumption of fossil fuels has been reduced nearly 19 per cent per capita compared to the rest of Canada, while the province’s gross domestic product has kept pace with the country’s. The report is the basis of an article to be published in the next edition of the journal Canadian Public Policy. Elgie said the group wanted to get the results out now so it can inform the environmental strategy discussions at the premiers’ summit starting Wednesday in Niagara-on-the-Lake, Ont. The key to the B.C. carbon tax shift’s success, Elgie said, is that it while taxes went up on fossil fuel use, income taxes were reduced, so it discourages pollution while encouraging employment and investment. Elgie said economists would predict the policy to work as it has. Elgie admits that with only four years of data, he can’t say for certain the changes in fossil fuel use in B.C. are entirely attributable to the carbon tax, but he’s confident most of them are. The rest of Canada’s premiers should consider following B.C.’s lead, Elgie argues. Alberta and Quebec also have carbon taxes.